Modern movies give a taste or a shadow of what modern espionage is about, i.e. the kind of people working in that world and the techniques they frequently employ. However, medieval espionage is more obscure. Of course, there are a few manuals on medieval spying systems and practices, but they are not something you pick off the public library or just any bookstore. Believe it or not, Secrets of the Ninja is a guide on medieval espionage. Its contents are culled and interpreted from Shinobi Hiden, one of the world’s oldest and real ninja manuals. The Shinobi Hiden is said to have been written by Hattori Hanzo (also known as Hanzo the Devil), a military leader and shinobi commander. A unique trait of Secrets of the Ninja is that it interprets the ancient manual and transforms it into a story form, albeit in a graphic novel format. In the book, you follow Nagata-sensei as he teaches his students about shinobi techniques and ethics as well as showing them various equipment and how to use them. Also, Nagata-sensei takes care to put these teachings into practice when he takes them on missions. Secrets of the Ninja's artwork is very structured and professional. It is detailed and draw us into the setting of the story. The dialogue is natural and capture the essence of medieval Japan. At the end of the book is a more detailed description of some ninja tools mentioned in the story. It is a nice touch and will please medieval weapons enthusiasts. Secret of the Ninja is a wonderful manual for beginners who desire to have a peep into the red world of ancient Japanese spies. Heartily recommended. 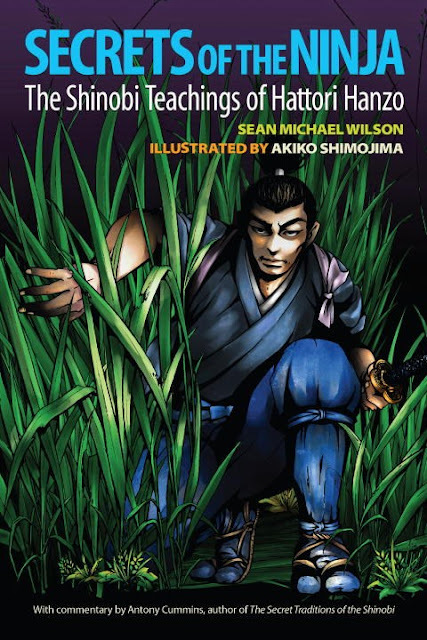 Secret of the Ninja is written by Sean Michale Wilson and illustrated by Akiko Shimojima. It is published by Blue Snake Books (July 7, 2015). Many thanks to Servant: Blue Snake Books for review copy. All images are © to their respective owners. This is the writer of the book. Thanks for this review and for showing various pages from our Secrets of the Ninja book. Excellent. However my name is actually SEAN MICHAEL WILSON. My sincere apologies, Sean. Thanks for getting in touch.